What contains four people, one cow, and a 1,000 pounds of butter? Why the Butter Sculpture at the 2010 Pennsylvania Farm Show, of course! On Sunday, January 10th, a colony of Pollies invaded the 94th annual Pennsylvania Farm Show held at the Farm Show Complex in Harrisburg, PA. Polly #2, #3, #12, and newly adopted Polly #23 joined ranks for one day of this eight day event. The Pennsylvania Farm Show starts the second Saturday of January and is the largest indoor agricultural event in America. 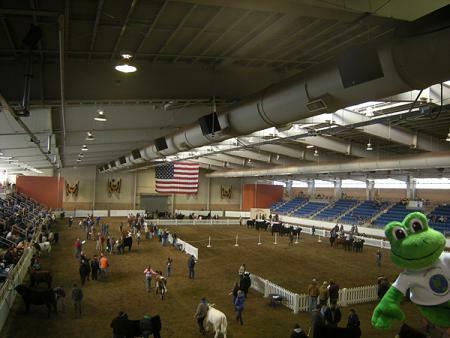 The Farm Show Complex houses 24 acres under one roof, spread throughout eleven buildings, including three arenas. 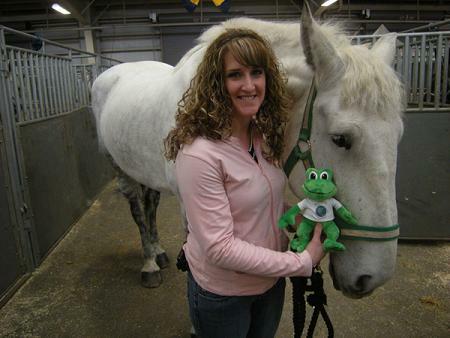 The PA Farm Show has something for everyone including farmers, non-farmers, and even frogs. The show will bring in 300 commercial exhibitors, 13,000 competitive exhibits, 6,000 animals, and nearly 500,000 visitors. 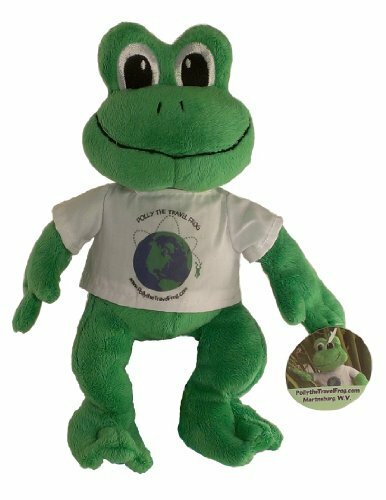 So what is a frog to do at this event? Just about everything! The complex is huge, but lucky for us, Jeff & Kristi along with Polly #12 knew this large facility like the back of their hand. We started out by watching the beef cattle judging. Like with all the competitive animal exhibits, farmers bring in their best quality animals, get them all cleaned up, and then show them to a panel of judges. The judges look at build of the animals and how they compare to the others and eventually pick an animal that stands out as the best of the breed. So while we watched the beef cattle competition, over the course of the next week, similar competitions go on daily for draft horses, dairy cattle, sheep swine, goats, rabbits and poultry. To my surprise, similar events took place for eggs, fruit, Christmas trees, apiary products, maple products, nuts and the list goes on and on and on. Next we went to see the draft horses. A draft horse is a very large animal. These horses are used around the farm to pull equipment, wagons and anything that needs a lot of power. One breed of draft horse are Clydesdales, but there are other breeds too. Today was the hitch competition, and if you’re familiar with the Budweiser Clydesdales, you have a good idea of what I am talking about. They hook up a wagon to any number of horses from 1 to 6 and compete against each other for best of show. Normally you can’t see the draft horses up close since it takes a lot of people and equipment to get a team of horses ready. However, for the past few years Kristi helped show the draft horses in competition here and had some connections. So a few minutes later, I got to meet Rosie. Rosie is a Percheron draft horse that weighs almost 1,700 pounds. Then to my surprise I ever got to sit on her back. It was a very exciting experience. But we had to leave quickly since her owners were getting all the horses ready for competition. 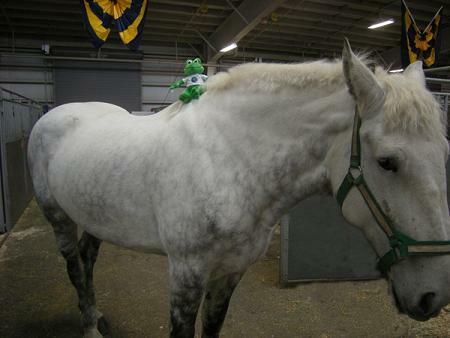 Polly rides a horse, but not just any horse, it's Rosie the draft horse! Is the picture really butter or is it just supposed to look like butter? 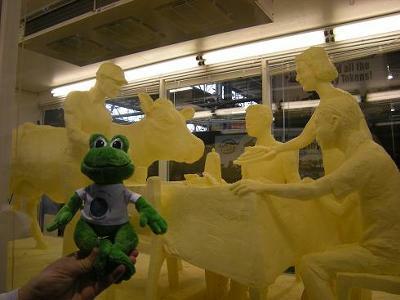 The sculpture, crafted from butter, donated by Land O’ Lakes in Carlisle, Pa., depicts a dairy cow, as well as a dairy farmer pouring a glass of milk at the breakfast table with his family members. Pennsylvania is home to more than 7,100 dairy farmers and 537,000 dairy cows. Dairy-related businesses contribute $7 billion annually to the state’s economy, spending about 85 percent of their income locally, and providing more than 40,000 jobs. 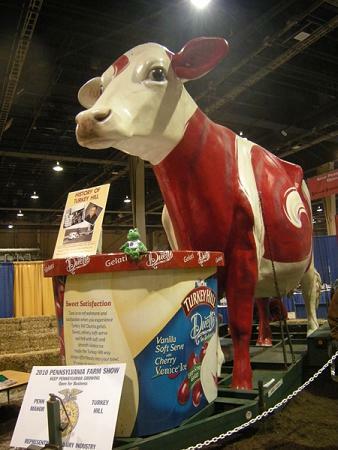 “The butter sculpture is a creative way to bring the dairy industry to the forefront of the media, and is an opportunity for dairy farmers to connect with and educate the general public in a unique way about producing milk, cheese, yogurt and butter,” says Vernon Horst, a Franklin County dairy farmer and chairman of the Mid-Atlantic Dairy Association. I think you did a really good job with this article. It was fun to read and I really liked the pictures. Rose looks very big. Were you scared or nervous to stand next to her? Thanks for the compliments about the article. The Farm Show is very big and there is a lot for people to see and learn about. Yes the draft horses are very big, especially next to Polly. They can also be very intimidating if you were never around them. My wife and I raise, train and show Quarterhorses so being around horses for us is second nature. 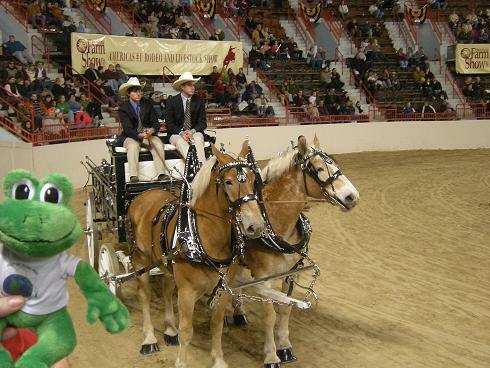 For the last few years, we also helped show draft horses at the Farm Show. They are really like gentle giants. Once Spring comes around we will have to take Polly out to our barn. I was at the Farm Show. Fun stuff. Maybe next year I will see Polly there too. The butter sculpture was really neat! !